Use Vanicream Lip Protectant SPF 30 to heal damaged, severely chapped lips. Relieve severely chapped lips with this hydrating balm. Before your lips can become dry, damaged, flaky and irritated from sun exposure, use Vanicream Lip Protectant SPF 30 to protect them. This highly effective sunscreen leaves a slight white cast on the lips until completely absorbed, allowing you to see your protection and make sure all areas are covered. This product also soothes irritation caused by cold weather, dry climates and wind exposure. The hydrating formula infuses lips with moisture to restore a soft and smooth texture. Sun protection ingredients in this formula protect against future damage by deflecting UVA and UVB rays. The formula is free of irritating ingredients so it is safe for even the most damaged or sensitive skin. Soothe severely chapped lips with the help of this cream. This lip protectant helps prevent aged and sun-damaged skin. Made with 6% titanium dioxide, Vanicream Lip Protectant SPF 30 protects against both UVA and UVB rays that cause burning and signs of aging. This formula also contains dimethicone that helps bind moisture to cells. Because of this, the balm leaves your lips soft and smooth while relieving dryness, cracking and irritation caused by environmental stressors. Like all other Vanicream products, this lip protectant is free of irritating ingredients such as fragrances, gluten, parabens, preservatives and lanolin. Even the most sensitive skin types can use this product to protect against sun-damaged skin. 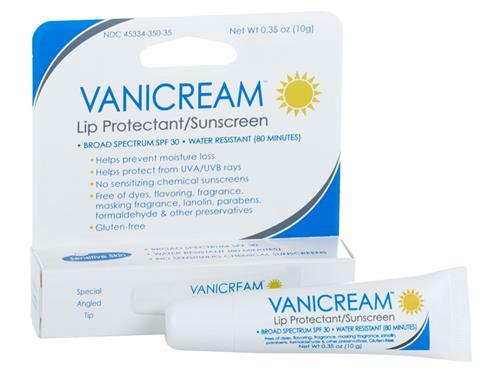 Tell us your thoughts about Vanicream Lip Protectant SPF 30 and receive 50 rewards points!